Kent's "Hooligan Libertarian" Blog: Orlando mass murder. Will people ever learn? A guy intent on murder has succeeded again, largely due to "gun control laws". Yes, he is ultimately responsible, but politicians (and property owners) practically held his hand, led him to his killing floor, and pointed out targets for him to kill. Because some of them are so blinded by a political agenda that they still believe saying "no guns" will save lives. These places are always "gun-free" slaughter zones- places where the good guys obey the evil rules saying they can't be armed, but where people who don't care about counterfeit rules (you know, like people who intend to murder a bunch of people in spite of laws forbidding murder) waltz in and start picking off the defenseless targets who have been disarmed for their convenience. Anti-gun "laws" kill- or at least make it easy for bad guys to use those "laws" to get a large body count. Notice how the killing always comes to an end after people (in this case, other bad guys) with guns show up. Why give the bad guys that time advantage? 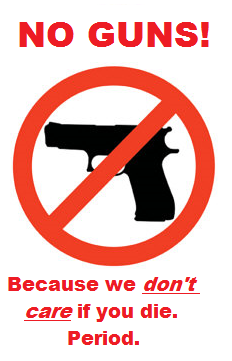 If a place says "no guns", remember what they are actually saying: "We don't care if you die". Oh, they'll be really sympathetic afterwards, but they'll keep their insane policy in place- or even double down- to make it easy for bad guys to kill unopposed yet again. Do not obey anti-gun "laws". Your life depends on it. Judging by the guy's name, I do have a suspicion that this was a Muslim "killing two birds with one stone"- killing homosexuals like his religion (among others) orders him to, and killing Americans who his politics tells him to kill. Perhaps I am being prejudiced in this suspicion and it is completely unfounded. Perhaps. Most people refuse to think about any data that doesn't meet their hope/belief system. That's why schools and religions (same thing) indoctrinate the template early and often. Some are cursed with 'observation and thinking', and can see the obvious and point out the obvious. That reasoned thinking is feared and demonized by cretins who declare themselves to be your master, and claim to own your very life. That thinking thing is dangerous to their continued ability to extract wealth from slaves unto themselves. Less thinking and speaking and (horror of horrors) acting- is what their media anthems demand. It's just a matter of time before it's revealed that the shooter had a working relationship, at some point in his life, with the FBI and/or the CIA. Every domestic shooter up to now has had one. Of course. Sigh. It has become too predictable.